My God, You Should Have Seen Us! Professor Litefoot and Henry Gordon Jago are accustomed to the murky fog of Victorian London and the palatable pints of half and half at the Red Tavern. They are not used to travelling through time and space with their old friend the Doctor. For the last two plays in this “season” of fan-service specials, we’re off in the company of Jago & Litefoot, previously known as guest characters from The Talons of Weng-Chiang but now Big Finish stars in their own right. 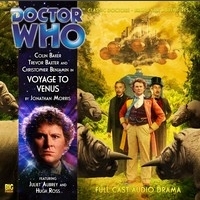 If you haven’t heard any of the J&L box sets, then what you really need to know before listening to Voyage To Venus is that during the course of the fourth series Jago and Litefoot encountered the Doctor once again – but this time in his sixth incarnation. Ol’ Sixey naturally offered our Victorian ‘Venturers a swift spin in the Tardis. This is what happened next. These two plays were originally offered at the bargain price of £1 each as a pre-order experiment. I was sold immediately. Victorians on Venus – how brilliant is that going to be? The quick answer is pretty damned good. As you’d expect, the tone is resolutely Burroughsian (Edgar, not William, thankfully). Venus is all lush jungles and strange alien beasts, where an Amazonian race of warrior women govern from a floating city.. It doesn’t take long for the crew to fall into trouble, captured by the warrior women and chucked into a cage as hunting trophies. The play is full of this sort of fun pulpy trope, playing far more to the strengths of the guest stars than to normal Doctor Who storytelling, but that doesn’t harm either side of the coin. Christopher Benjamin and Trevor Baxter are almost effortless, playing off each other and the scenario with great humour and becoming interplanetary heroes in the process. There’s even a piece of service to the Pertwee-era soothing of Peladon’s monster, as Venus resounds to an uncertain chorus of God Rest Ye, Merry Gentlemen. That’s a bit wedged in, but it does at least fit in with the surroundings. Hugh Ross’s hive-mind alien is creepy without affecting the overall tone of the play, and the Venusians are requisitely brash and superior. I would have liked to see/hear more of the floating city, but you can’t have everything in a one-hour special. Brilliant fun, and recommended for even casual listeners – you really don’t need a lot of knowledge about the adventures of Jago and Litefoot to enjoy it.